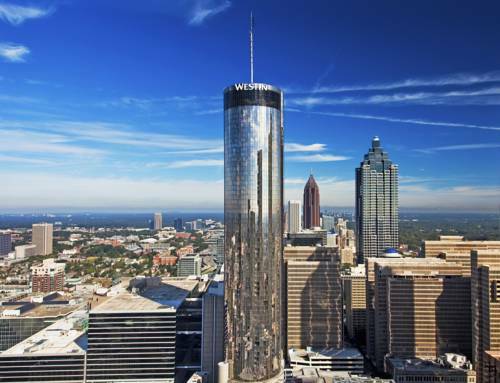 This 73-story tower, topped by the revolving Sun Dial Restaurant, Bar & View, graces the heart of Atlanta. Connected to AmericasMart, The Westin Peachtree Plaza, is steps from CNN, Georgia Aquarium, Georgia World Congress Center and the Georgia Dome.Our 53 breakouts, totaling 80,000 square feet, provide unparalleled flexibility in planning your meetings. When business is done, relax in our retractable-roof pool, health club or walk to downtown nightlife and attractions.Renowned Atlanta architect John Portman designed our hotel, the tallest in the Southeast U.S. All 1,073 guest rooms and suites feature floor-to-ceiling glass windows, desks, High Speed Internet Access, the Heavenly Bed, and a marble Heavenly Bath. Our central downtown location is just a few short blocks from the key financial and business offices. We're in the heart of the convention district and are just steps from the new Georgia Aquarium - the world's largest aquarium, as well as Atlantic Station - Atlanta's new retail and entertainment district, and the new World of Coke. We are also convenient to the many great restaurants, nightclubs, and stores on Peachtree Street. Come enjoy The Westin Peachtree Plaza, Atlanta. Located on the lobby level, The Caf serves a Southern-style buffet breakfast including eggs made to order, homemade breakfast cereals, fresh pastries, Belgian waffles and fruit. A la carte items also are available. Open daily, the newly renovated Bar 210 is the place to catch up with friends and colleagues, indulge in signature cocktails, have a light bite or unwind for the evening. There are few settings more dramatic than a sleek, glass-walled dining room that slowly rotates a full 360 degrees 73 stories above the street. Sun Dial Restaurant is ideal for special occasions, corporate dinners, and quiet relaxation. Open daily at 6am, the newly expanded and renewed Starbucks Coffee Bar offers a variety of coffee and sells it along with fresh, rich-brewed, Italian-style espresso beverages, pastries, small snacks and confections. Unwind with friends and colleagues as the Sun Dial Bar makes a full rotation every 60 minutes. Specialty drinks are served in souvenir glasses, and cocktails, beer, wine, and non-alcoholic drinks are also available.